When my family eats at American Flatbread in Burlington, we get the family-sized Evolution Salad. According to the menu, it serves approximately eight people. Each time my brood of four orders it, we end up assuring the waitstaff that we really know how big it is, and we really want that much salad. Upon its arrival we descend like vultures, squabbling over the last leaves. The best part is the salad dressing — a perfect balance of salty, sweet, sharp and savory. Recently, I decided to try to recreate that dressing at home. The finished product turned out a bit different than the original but, according to my family, I nailed it. We happily consumed giant bowls of mesclun mix from our farm share dressed with it. Since then, I've used it on heads of butter lettuce, baby greens and romaine. 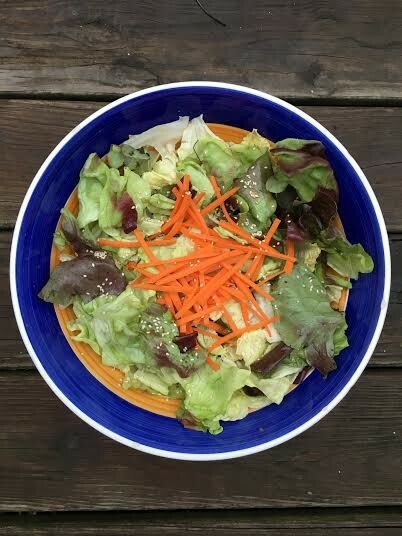 The ginger’s warmth, the sesame oil’s deep toasty flavors, the sweetness of the honey and the umami (or fifth sense) of the miso makes a wonderful bowl of salad, one that's worth fighting over. Combine all the ingredients and whisk vigorously or blend with an immersion blender, mini food processor or blender. Lightly dress salad greens before adding extra ingredients. To approximate American Flatbread's version, top with grated or julienned raw carrots or beets, thinly sliced celery, toasted sesame seeds, and crumbled blue cheese or feta.